Box Text: One of the Nintendo Entertainment System's acclaimed launch titles returns, re-mastered in stunning 3D! The original Excitebike game returns, re-mastered with Nintendo's 3D technology and available exclusively via Nintendo eShop! Tackle perilous obstacle courses alone or face off against rival bikers as you compete in white-knuckle motocross races that pit you against the clock. Make good time, and you might get a chance to race in a legendary Excitebike rally. Or if you feel the need for customized speed, create your own tracks to race on using the intuitive Course Editor feature that now lets you save up to 32 dream courses of your own design! Get ready for the ride of your life - with 3D Classics: Excitebike, and rediscover an old favorite enhanced to a new dimension! 03-31-2015 desocietas Box Text One of the Nintendo Entertainment System's acclaimed launch titles returns, re-mastered in stunning 3D! The original Excitebike game returns, re-mastered with Nintendo's 3D technology and available exclusively via Nintendo eShop! Tackle perilous obstacle courses alone or face off against rival bikers as you compete in white-knuckle motocross races that pit you against the clock. Make good time, and you might get a chance to race in a legendary Excitebike rally. Or if you feel the need for customized speed, create your own tracks to race on using the intuitive Course Editor feature that now lets you save up to 32 dream courses of your own design! Get ready for the ride of your life - with 3D Classics: Excitebike, and rediscover an old favorite enhanced to a new dimension! 02-19-2014 karyann Box Text One of the Nintendo Entertainment System's acclaimed launch titles returns, re-mastered in stunning 3D! 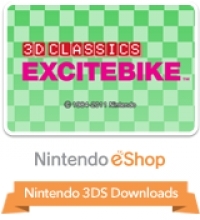 The original Excitebikeâ„¢ game returns, re-mastered with Nintendo's 3D technology and available exclusively via Nintendo eShop! Tackle perilous obstacle courses alone or face off against rival bikers as you compete in white-knuckle motocross races that pit you against the clock. Make good time, and you might get a chance to race in a legendary Excitebike rally. Or if you feel the need for customized speed, create your own tracks to race on using the intuitive Course Editor feature that now lets you save up to 32 dream courses of your own design! Get ready for the ride of your lifeÂ¬ with 3D Classics: Excitebike, and rediscover an old favorite enhanced to a new dimension! 04-28-2013 psiencewins Box Text One of the Nintendo Entertainment System's acclaimed launch titles returns, re-mastered in stunning 3D! The original Excitebikeâ„¢ game returns, re-mastered with Nintendo's 3D technology and available exclusively via Nintendo eShop! Tackle perilous obstacle courses alone or face off against rival bikers as you compete in white-knuckle motocross races that pit you against the clock. Make good time, and you might get a chance to race in a legendary Excitebike rally. Or if you feel the need for customized speed, create your own tracks to race on using the intuitive Course Editor feature that now lets you save up to 32 dream courses of your own design! Get ready for the ride of your lifeÂ¬ with 3D Classics: Excitebike, and rediscover an old favorite enhanced to a new dimension! 01-22-2013 st01c Description One of the Nintendo Entertainment System's acclaimed launch titles returns, re-mastered in stunning 3D! The original Excitebikeâ„¢ game returns, re-mastered with Nintendo's 3D technology and available exclusively via Nintendo eShop! Tackle perilous obstacle courses alone or face off against rival bikers as you compete in white-knuckle motocross races that pit you against the clock. Make good time, and you might get a chance to race in a legendary Excitebike rally. Or if you feel the need for customized speed, create your own tracks to race on using the intuitive Course Editor feature that now lets you save up to 32 dream courses of your own design! Get ready for the ride of your lifeÂ¬ with 3D Classics: Excitebike, and rediscover an old favorite enhanced to a new dimension! This is a list of VGCollect users who have 3D Classics: Excitebike in their Collection. This is a list of VGCollect users who have 3D Classics: Excitebike in their Sell List. This is a list of VGCollect users who have 3D Classics: Excitebike in their Wish List.